Where Roots And Wings Entwine: Summer babywearing wishlist. 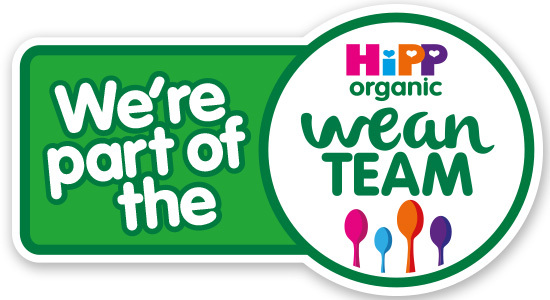 As Jelly Bean gets bigger and heavier it is fast becoming apparent that our stretchy wrap cannot handle carrying him as well as it once it, considering he is now 9 months old I think our Boba stretchy wrap has served us well and been loved lots, numerous times a day on a daily basis! With Jelly Bean outgrowing the stretchy wrap my thoughts have turned to what other wraps, carriers and accessories I would love to get so that we can carry on and compliment our babywearing journey. In the hope of us having a hot summer with lovely, sunny days to enjoy our adventures in top of my wish list is a cool 100% natural cotton gauze Calin Bleu wrap. 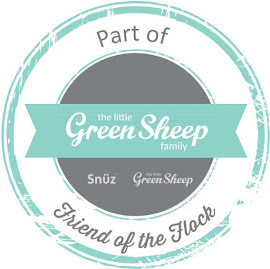 The lightweight but strong wrap will be perfect for helping Jelly Bean keep cool as we enjoy our summer together. Plus as Calin Bleu wraps are machine washable and dry quickly they would be extremely practical for keeping up with our daily adventures and family days out this summer. Whilst I love all of the colourways of the Calin Bleu wrap I have a particular fondness for Ocean Teal and Summer Breeze. Admiring Nova Baby Carriers custom creations I would love to add at least one of their carriers to our babywearing collection. 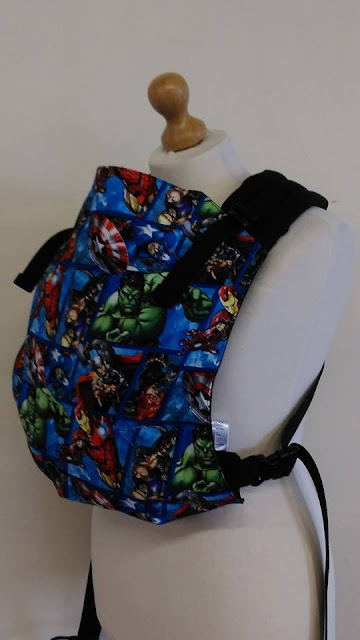 To compel Lee to babywear more with Jelly Bean and to satisfy our love of superheroes I would love to have a custom carrier with a superhero themed fabric made by Nova Baby Carriers. Their deluxe Mei Tai and Deluxe Full Buckle are on my wish list, and I hope one day to design a truly custom carrier with a little from Nova Baby Carriers. As we love the water, whether it is in the swimming pool or in the splashing in the sea when visiting the beach I would love to get a water sling for our wet and water themed adventures this summer. The MaM Water Sling available in the UK from Baby Armadillo which is made from breathable and quickly drying polyester mesh that doesn't absorb water would allow me to be hands free when playing in the pool or at the beach with Bug whilst also enabling Jelly Bean to be in on the fun water play too. 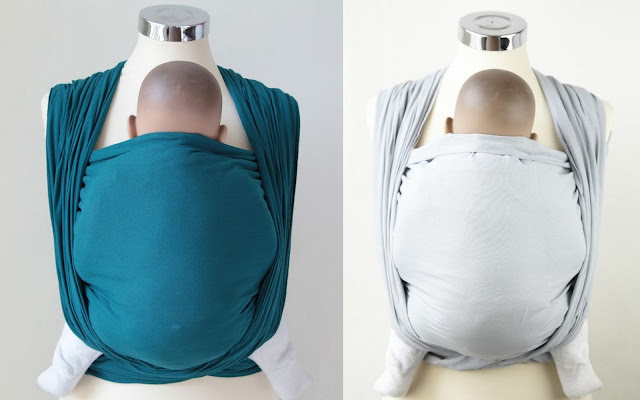 I've loved the look of Hoppediz Hop-Tyes for a long time now as I love that they are a soft and supportive carrier that combines the ease of a Mei Tai with the comfort of a woven wrap. Whilst I love a number of Hop-Tye designs with the Los Angeles Grey satisfying my obsession with grey and stars. I have also fallen in love with the colourful and absolutely beautiful San Francisco Hop-Tye that can be bought on the Carry My Baby website. As I have never owned a woven wrap having one has been a long dream of mine. With my little ones dad coming from Yorkshire I have found myself drawn to the beautiful Shire Slings that are made with love in Yorkshire. I love that their unique woven baby wraps are made using the highest quality durable, locally sourced materials and that they strive to keep the areas historic weaving heritage alive. 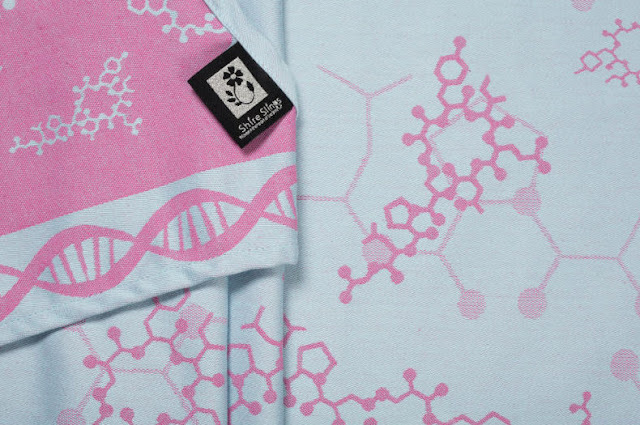 Speaking to my inner geek I have fallen in love with the Love Geek wrap and its clever design that sees DNA, oxytocin and mitochondria cells spelling out 'mother love'. With my heart still strongly yearning for their original Acid Fuchsin Love Geek colourway yet adoring their new Periwinkle colourway I find myself in love and wanting both! Sew Down Purple Lane babywearing booties. Having already owned and loved a pair of Sew Down Purple Lane's gorgeous boots that Jelly Bean has unfortunately grown out of, another pair of their boots is a must for my babywearing wish list. 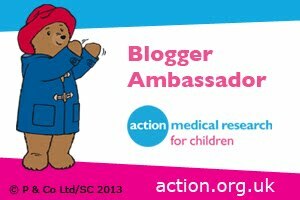 As Jelly Bean is a lively little one, kicking away when being carried I was impressed with the fact that not once did he manage to kick off his beautiful splash paint boots from Sew Down Purple Lane where previously all other boots had been sent flying with a kick or swish of his foot! With the boots being unkickable and very cute I need a new pair or two for my growing boy's feet. As I love, love, love the colourful star blankets designed to be worn when babywearing getting one from Handmade Blankets and Beanies is something I plan on making sure happens this year! I adore their colourful rainbow star blankets and think it would be ideal for covering Jelly Bean and keeping him cosy on chillier days. To satisfy Jelly Bean's teething and his need to fiddle and play with things I want to get some new teething jewellery to wear when we are babywearing. 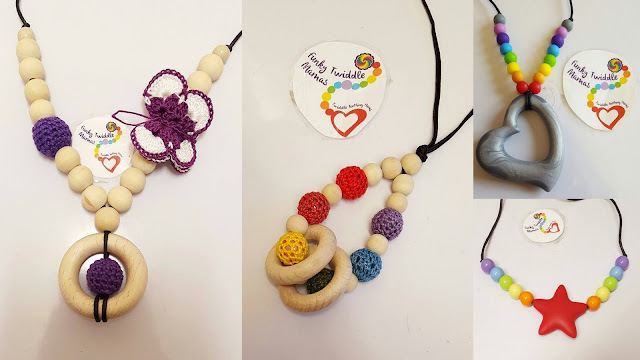 I am especially attracted to the colourful, clever and eye-catching teething and nursing necklaces by Funky Twiddle Mamas. As well as teething/nursing necklaces Funky Twiddle Mamas also create unique teething clips and baby safe bracelets - a number of their custom creations that can be made to compliment your baby carrier can be seen on the Funky Twiddle Mamas facebook page. Here's hoping that I can get at least a few of things off of my babywearing wish list this year and perhaps a few things more! Fingers crossed our babywearing journey will continue for a long time to come so that I can enjoy sweet snuggles with my beautiful Jelly Bean. Have you any suggestions of wraps, carriers, or babywearing accessories that I should add to my wish list? I'd have loved to have done baby wearing with Blake but he hated it. I had quite a few carriers I had to get rid of but my favourite one is a rose and rebellion one. The teething necklaces in ur list are great by the way we have had one since Blake was born and its been a must have. 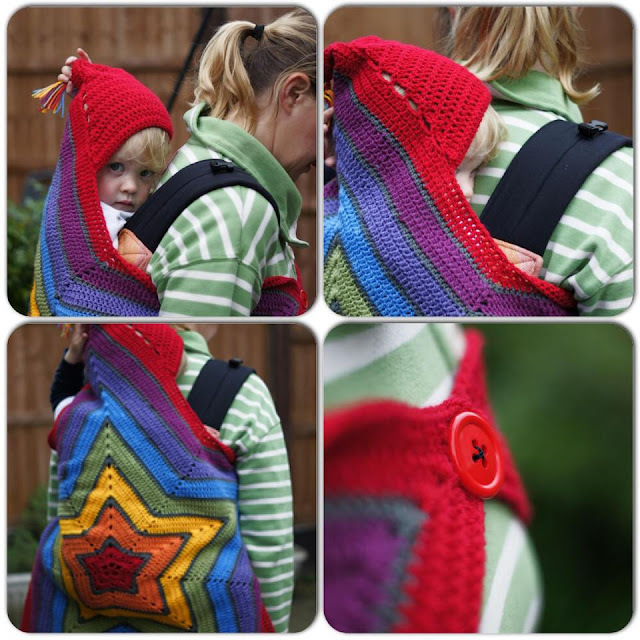 Oh that babywearing star blanket is amazing! Love that. I really liked my Ergo this time around, and a Papoozle when she was smaller. I couldn't do baby-wearing with the twins!! I think it would have broken me to have one strapped to the front, one to the back!! My boy and I both had Ergo carriers for when we were out and about with the twins but that was the only time I used it. I love that star blanket, so careful and cosy too, I remember having a baby sling when my son was little and found it invaluable until he was about 9 months old. Miss wearing my baby so much. She's 8 months and I'm now 6 months pregnant so the weight isn't good on my back or bump.